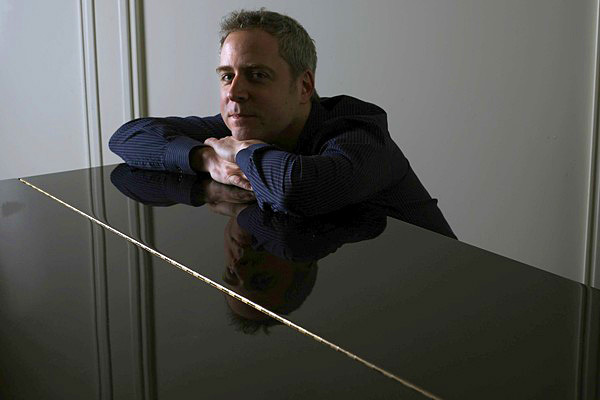 New York-based pianist and star blogger Jeremy Denk seems to like the sixth borough, otherwise known as Philly, performing at Verizon Hall for the third time in the last two years. He was in front of Charles Dutoit and the Philadelphia Orchestra very much the showman, highlighting an interesting, not entirely cohesive program of Liszt, Prokofiev and Henri Dutilleux (part of Dutoit‘s season-long French composer series). Dutilleux, now 94, is musical heir apparent to Ravel and Debussy. Dutoit chose his 1978 composition, “Timbres, espace, mouvement, ou la nuit étoilée,” a piece that demonstrates that the composer is compelling and not derivative of those masters. The composer cites Van Gogh’s “Starry Night” painting as his inspiration — abstractly, one guesses, because the music is a sound Rorschach of moods and visuals. Dutoit essayed an eerily airless start to “Timbres.” Metallic effects and percussive novas flare from nowhere to keep you off-center, but more intriguing are dense orchestral passages sounding like inverted melody lines. A 12-strong cello section, instead of a standard line-up with violins-violas. But this configuration seemed vaporous in the first section (“Nebuleuse”). The cellos weighed in during the second half (“Constellations”) dramatically, with basso bowing reminiscent at points of Bernard Herrmann’s film score to “Psycho.” By the end, the orchestra crystallized the sound and vision, but it seemed coldly academic. The atmospherics of the Dutilleux are a million miles from the Franz Liszt’s Piano Concerto No. 1, a virtuosic showcase for Jeremy Denk, and he delivered, even with some campy affectations (rapturous facial expressions and dancy arms). Liszt was at risk of listing. But Denk had moments of sublime engagement with the orchestra, highlighted by muscular trio phrases with principal violin David Kim and cellist Efe Baltacigil. In the central solo section, Denk stripped away any velvet drapery with unfussy technique and authentic passionato. Dutoit is so adroit going beneath the surface on an easy crowd-pleaser like Sergei Prokofiev’s ballet scenes from “Romeo and Juliet,” giving all parts equal musical space (unlike Riccardo Muti’s erratic rendition here last winter with the NY Phil). Juliet’s theme as vibrant as the court processional and the tempo precision during Tybalt’s swashbuckling demise kept the ballet narrative vivid. Dutoit also ignited a glowing sonority in the strings.